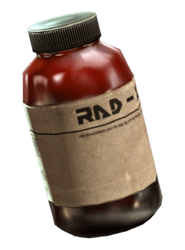 Rad-X (diluted) is a Chems consumable in Fallout 76 (FO76). Players may use this item to regenerate health, cure Addictions and Diseases, slow time, temporarily change the player's SPECIAL stats and add various other unique effects. Many Chems can be bought from medical supplies vending machines. It's possible to become addicted to some chems, which will result in decreased stats until the addiction is cured. "Rad-X significantly increases your Radiation Resistance for a limited period of time. RadAway completely removes any radiation you've already been exposed to." In the intro area of vault 76 before leaving. There would be some ready to be taken items given to the player.